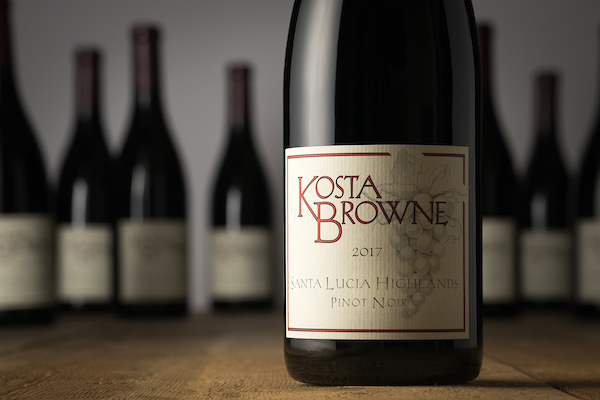 Located on the eastern slopes of the coastal range that shelters the fertile Salinas Valley from Big Sur, this appellation is relatively new with the first vineyards being developed only in the 1970s. Surprisingly, these central coast slopes are generally cooler than the Russian River Valley, largely as a result of the ocean breezes and fog coming in from Monterey Bay. The vineyards are sheltered by the coastal peaks that limit rainfall. Pinot Noir excels on these hillsides - which is why our travels took us here. During the 2017 vintage, the Santa Lucia Highlands were not impacted as much by the California heat as other areas due to the legendary driving winds traveling south from the Monterey Bay. Like no other vintage before, we methodically picked our way through the appellation, one by one, harvesting fruit a its optimal ripeness. Nose: Lemon zest, dried cherry, cranberry and subtle fresh basil. Hints of toasted oak, sage brush and caramelized blood orange. Mouth: Balanced, rich and intricate, with well-integrated tannins and seductive tension. A long, lingering finish.